The End of Net Neutrality: A Nightmare for Entrepreneurs and Small Biz? home / STARTicles / The End of Net Neutrality: A Nightmare for Entrepreneurs and Small Biz? Network neutrality is the notion that Internet service providers (ISPs) should treat all data that travels over their networks equally. This means that ISPs can’t block, edit, or discriminate against the information you and I share and access online, like the websites we visit or the applications we use. Net neutrality rules prohibit internet service providers like Comcast, AT&T and Verizon from slowing (“throttling”) or blocking certain websites while prioritizing sites that pay for fast lanes. In principle, the rules protect equal access for every individual and business, thereby creating a level playing field that allows start-ups and smaller businesses to compete with large corporations. Critics of the repeal say that it would create a pay-to-play environment that would give too much power to a few giant corporations and that small businesses would suffer. Further, consumers fear that the repeal of net neutrality would allow ISPs to charge users more to see certain content and to control or censor what internet users could see and do on the Web. Proponents of the repeal, such as FCC Chair Ajit Pai a former Verizon attorney and Trump appointee, call net neutrality regulations “heavy-handed.” They say that the rules hinder investment, innovation, and job creation and that the repeal could allow internet providers to offer faster, cheaper internet to consumers. This view finds support from technology industry analyst and blogger Ben Thompson who argues that, while he supports net neutrality, he thinks the FCC is right to repeal rules that ban broadband providers from blocking, slowing down, or otherwise discriminating against legal content. In the two-year period following the new rules, overall broadband-related investment among [ISPs] was up 5% from the two-year period immediately preceding them, Free Press found. And if you exclude Sprint and AT&T, both of which decreased their investment after completing the build out of their high-speed LTE networks, overall investment would have been up 9%, according to the report. What do small business owners and advocates say? 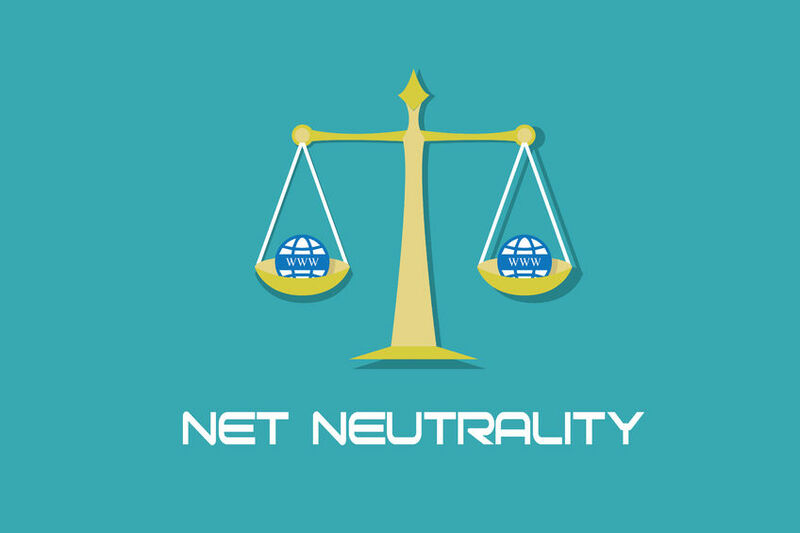 Without these rules [ensuring net neutrality], internet service providers will be able to favor certain websites and e-businesses, or the platforms they use to garner new customers, over others by putting the ones that can pay in fast lanes and slowing down or even blocking others. Businesses may have to pay a toll just to reach customers. This would put small and medium-sized businesses at a disadvantage and prevent innovative new ones from even getting off the ground. When we met at a local coffee shop, Anne leaned over her cup of cappuccino and described how she began her business by blogging and publishing content via her web site. During that initial start-up phase, she said, almost 100% of her clients found her through search engines like Google because, even though hers is a boutique firm, she listened to savvy advice and chose her url well. Traffic to her website steadily increased, and her site climbed higher and higher in search results. However, starting a small business like hers from scratch might not have been possible without net neutrality. Net neutrality meant that Anne’s small start-up could compete with much larger consultancy and advising firms. Anne’s fear, she confided, is that the repeal of net neutrality would make it impossible for her to continue to compete with large corporations, as she has been doing. She worries that ISPs will sell greater access to large companies that can afford to pay for it, edging out businesses like hers. Since she’s a futurist, who uses data and social science to forecast the future instead of tea leaves, I asked Anne to predict what would happen if the FCC votes to kill net neutrality. She envisions two possible scenarios—one dystopian and one utopian. Dystopia: ISPs could become monopolies who took advantage of the pay-to-play model of the web—strangling traffic to potential competitors and small businesses that couldn’t afford to pay for access, throttling some sites and censoring others if the price was right. Utopia: The end of net neutrality might lead to investment from large corporations that could in turn enable ISPs to provide faster 5G service. Increased capacity could pave the way for smart cities—with vehicles, lights, and other internet-of-things devices communicating constantly and instantaneously. Consumers would benefit from faster, cheaper internet service. Trusting ISPs not to press their advantage, however, might be something like having the dingo watch the baby, concluded Anne. Eventually I expect what we think of as the World Wide Web is going to be about as exciting and relevant as network television, with most people moving to decentralized applications built on blockchain or the dark web…. You can always count on entrepreneurs and the people who fund them to find opportunities in times of chaos and transition. It’s not impossible to imagine the current shift having an impact on my business, but I feel good about my ability to survive. An FCC vote on the repeal of net neutrality is scheduled for December 14. If you would like to affect the decision—one way or the other—here are some things you can do. Contact your representative in Congress to express your views. 2 Contact the FCC directly to let them know what you think about net neutrality.